Because it is a statistical fact that there are a lot of fires in commercial cooking facilities, Fire suppression systems have changed to protect the modern kitchen. Having a good fire protection system in a restaurant or institutional cooking facility is more important than ever before. In the last 10 years major developments have changed the ways of commercial cooking. Cooking equipment currently manufactured uses more efficient burners, resulting in much higher heating rates. More cooking is done with vegetable oil instead of animal fats. Vegetable oils have a much higher autoignition temperature. Fryers are now made with improved insulation that slows the cooling rate, but which also increases the risk of a re-flash in the event of fire. Kitchen suppression systems are actuated by a fusible links located above the cooking appliances. The links melt during a fire, causing cartridge to fire propelling gas into the liquid agent tank. The distribution piping system carrys the agent to nozzles located above the cooking appliances, in the plenum above the filters, and in the duct above the plenum. When updating your kitchen system to the latest technology, be sure and change your fire extinguishers, too. Fire extinguishers designed specifically for kitchens are now available. Please note that changes by the National Fire Protection Association (NFPA) #10 now require this special "K Class" hand portable fire extinguisher in cooking areas. 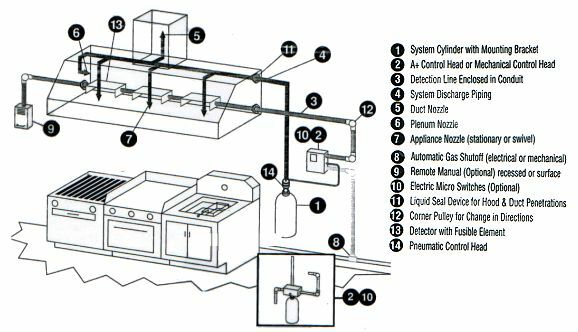 Below is a diagram of a typical kitchen suppression system setup. Copyright 2013 Louisville Fire Protection, LLC. All rights reserved.